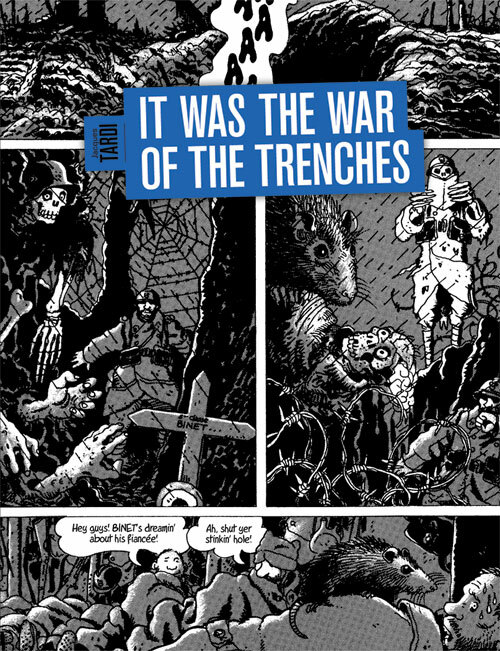 Tardi’s technique for this book is very interesting: he recounts soldier’s tales, over and over. Each is horrible and dark, fully illustrating his overall theme that World War One was a tragic waste. It’s a compelling and difficult read: there are no uplifting moments, just more of the same death and despair experienced by the foot soldiers. In his foreword Tardi states “The only thing that interests me is man and his suffering, and it fills me with rage”. That rage is funneled at the generals and politicians during WWI and their utter disdain for the life of the common man. There is a steady progression and pace: it starts with new arrivals and their view of the front and progresses into darker and more sobering experiences. Tardi even relates his grandfather’s experiences in a text only centerpiece. Each new tale draws you a little more into these biographies until you’re right there with them in the trenches, accepting and reviling what was endured. 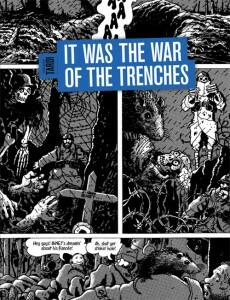 It’s a hard read and at times felt like work to get through; Tardi finishes with raw statistics of the dead, maimed and destroyed. The art style is rounded and has a soft finesse. The book is black and white and Tardi made good use of grayscale. The soldiers have a haunted, tired look in their eyes and facial expressions that really reinforces the text. After finishing the last page and closing It Was The War Of The Trenches you’re struck by the feeling this book needs to be read: everyone should know what went on so that we can work to ensure it doesn’t happen again. There’s a filmography and bibliography at the back should you wish to further explore the subject.